Hello all! I know it has been a long time since we put out our newsletter. We have been busy with the PRBC retreat, and doing some rearranging here at the shop. We have many NEW samples and kits here at the shop that you need to see! New fabric comes in every week it seems. There are couple of things we'd like to say about our classes. First, please pre-register far enough ahead that we can order enough supplies (patterns, rulers, etc). Second, pre-register so we won't have to cancel the class - if you know you want to come let us know so we don't cancel the class for lack of participants. Third, for classes you need to bring your sewing machine (in good working order), thread, bobbin, scissors, pins, rotary cutter, ruler, mat, fabric marker, and any other basic sewing supplies you use. We don't always have enough of these items to share with you and others. If you need to rent a machine, let us know in advance. Our class refund policy is: If we cancel a class and you have paid, we will refund your money (if you paid cash or check) or give store credit (if you paid by credit or debit card). If the class is rescheduled and you paid we will register you for the rescheduled date (if that works for you). If you cancel at least 72 hours in advance refund policy above applies, but if it is less than 72 hours, no refund. You can transfer your spot in class to another person at any time before class, just let us know. 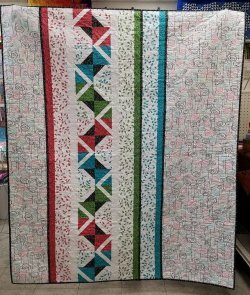 This class will be demonstrating the use of the Quick Curve Ruler and piecing technique. You will have time to complete several blocks using the technique. You can choose your own project. There is no cost for the demonstration. You must purchase the ruler if you want to use it. The ruler has a table runner pattern included. 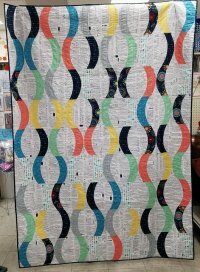 We have a few patterns for quilts using the ruler also. We have a limited number of rulers available. Please register soon so we will have enough rulers. We need to know by Feb. 5th! There will be a class discount that day for participants (some exceptions apply). We have a limited number of kits available in the colors we used. If you purchase the kit we used: 10% off the kit. You can choose your own fabrics as well. The pattern is included in cost of class. You must register for this class. We will be having the classes at the NDSU Research Center in Langdon. We are hosting Open Sewing Days on the 1st and 3rd Thursdays of each month (usually). This is free to attend. Bring your machine and projects. If you need help with your project, then you should come and maybe we can help. Check the calendar on our website for more dates. The NEXT one is Thursday, Feb. 15th! We will learn to make the BQ goes mini block. 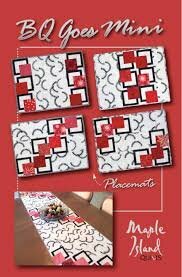 With these blocks you can make placemats, or two sizes of table runners. The class will take both nights to complete a project, but the second night is optional. You must pre-register by Feb. 20. Sale excludes clearance priced merchandise! Our Sew Together Bag class was cancelled due to lack of participants. We have decided to reschedule that class in April. Dates to be announced later! Be on the look out for an Anniversary sale coming soon....we are planning a BIG sale starting February 26th until March???? We will be celebrating our 5 year anniversary! We opened the store in February 2013!